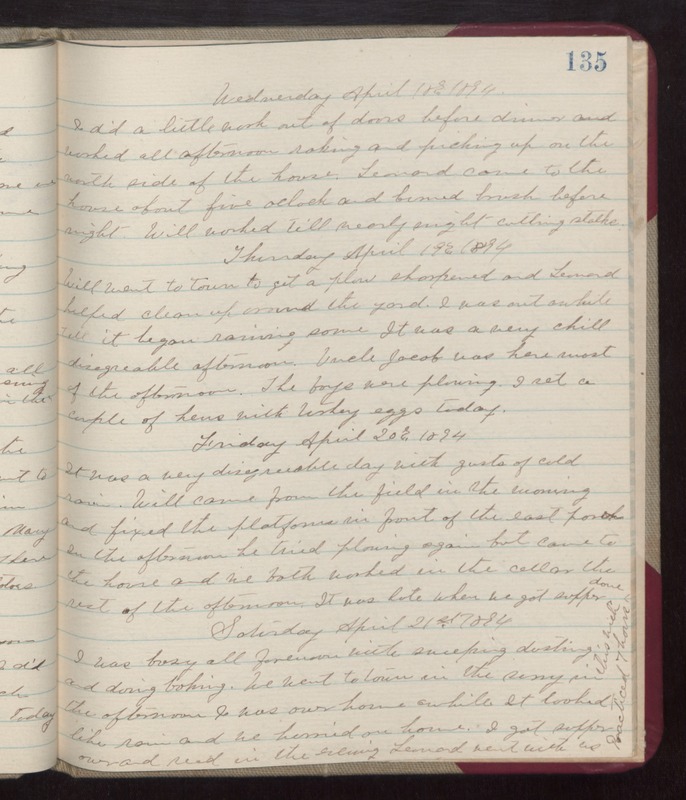 Wednesday April 18th 1894 I did a little work out of doors before dinner and worked all afternoon raking and picking up on the north side of the house. Leonard came to the house about five oclock and burned brush before night. Will worked till nearly night cutting stalks. Thursday April 19th 1894 Will went to town to get a plow sharpened and Leonard helped clean up around the yard. I was out awhile till it began raining some. It was a very chill disagreable afternoon. Uncle Jacob was here most of the afternoon. The boys were plowing. I set a couple of hens with turkey eggs today. Friday April 20th 1894 It was a very disagreable day with gusts of cold rain. Will came from the field in the morning and fixed the platform in front of the east porch. In the afternoon he tried plowing again but came to the house and we both worked in the cellar the rest of the afternoon. It was late when we got supper done. Saturday April 21st 1894 I was busy all forenoon with sweeping dusting and doing baking. We went to town in the surry in the afternoon. I was over home awhile. It looked like rain and we hurried on home. I got supper over and read in the evening. Leonard went with us. Practiced 7 hours this week.